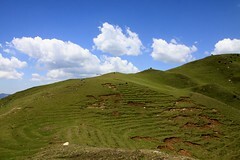 The tiny settlement of Shoja is just about 25kms SW of Gushaini and about 5kms north of Jalori Pass, which connects Shimla district with Kullu. From Gushaini Mr. Raju of Raju’s Guesthouse dropped us off at Shoja’s Banjara Retreat on the morning of the 17th. In this half hour ride, we gained an altitude of more than 4000ft and Madhu immediately started feeling the ill-effects of this . We had read and heard about altitude sickness before, but this was the first time that one of us was affected with it, taking us completely by surprise. Madhu felt the beginnings of a headache just as Mr. Raju drove up to Shoja and then it lasted for almost 2 days. It was accompanied by slight dizziness and stomach cramps; a complete energy-sapper! Banjara’s host Mr. Rishi advised that one way to get acclimatized to the altitude was to walk around, which we did on our 2nd day there but it completely tired Madhu out and then we decided to simply stay put and rest. Mr. Rishi also said that if the illness persists, then we must consider going back down to a lower altitude. Luckily, though, by our 3rd day in Shoja Madhu’s symptoms receded. We decided to stay indoors that day as well just to ensure that he recovers completely. Sitting high above the Tirthan Valley and at the southern limit of Kullu district, Shoja is fantastically located with the peaks of Jalori pass before it and view of the snow-clad Dhaluadhar range in the distance. Its altitude made us feel like we were up in the clouds as we could see many serenely floating by, almost at eye level, from the Banjara Retreat. When Mr. Rishi had suggested we walk around to acclimatize ourselves, we headed out for a 4km hike to a nearby waterfall. 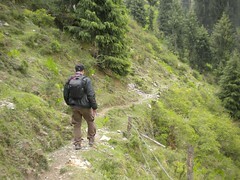 After climbing Banjara’s steep, 100 odd steps back to the road, we walked south & uphill towards Jalori Pass. This road is potholed, steep and curvy; not exactly ideal conditions for driving. However, on an overcast morning, with low vehicular traffic, it is a lovely area to walk in. Deodars and Spruce trees line the road on either side. 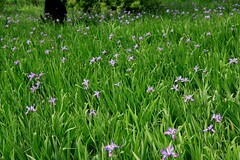 But what makes the scenery absolutely spectacular is the carpet of Blue Iris plants that cover the land between the trees. Their purplish-blue blooms look like little orchids and are simply beautiful. They bloom in the summer months and are apparently what attracts visitors from afar to Shoja. About a kilometer from the Retreat, a narrow dirt trail forked off to the right from the road and led us slightly downhill through a forested area for another kilometer. Here there were more fields of Blue Iris and we were able to see them up-close. They made our walk to the waterfall quite special and completely worth the while, especially since Madhu, still struggling with altitude sickness, was short of breath and finding every step difficult. When we finally got to the waterfall, we found it hidden in a forest of thick, wild shrubs and it turned out to be nothing more than a tiered trickle of water running down the mountain side . This was expected in summer and Mr. Rishi had warned us not to expect anything more. Even then I was slightly disappointed. Oh well! At least the walk was nice! 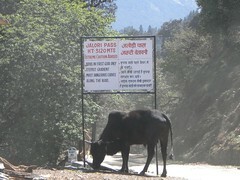 Yesterday, when Madhu was feeling much better, we ventured out to explore Jalori Pass; it was our 4th day in Shoja. As there were longish walks from the Pass to a fort and a lake, we decided conserve our energy by hitching a ride to the Pass on a local bus. However, the lone HRTC bus that trudged up the hill, was completely packed with some passengers sitting on its roof as well . The bus driver didn’t bother stopping for us. Then luckily, a family kindly offered us a lift in their car as they were headed in the same direction as well; we were most grateful! 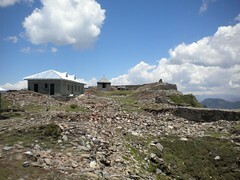 Raghupur Fort lies about 3kms west of Jalori Pass and on clear days, can be seen quite distinctively from Shoja. After a breakfast of Masala Omelets and bun at a dhaba at the Pass, we headed towards the fort. The 3km walk took us off the main road onto a dirt trail through a thick forest of oak trees. The trail was laden with dried leaves and fallen rhododendron flowers. It was quite picturesque and reminded me of our trek to Jaubagh from Hatu Peak. The first 2kms were easy and went by quickly. White arrows helpfully painted on boulders marked the way as there were several trails all over the place. We got to a small meadow where we took a short break, clicking pictures and gaping at the wonderful scenery around. Here we met an elderly Himachali man who was on his way to a nearby village. As expected, he stopped to smile and chat with us . He pointed to a hillock ahead of the meadow and said that Raghupur Fort was atop it. The climb looked a little intimidating but the elderly man encouraged us saying that the views from up there would be truly spectacular and totally worth the effort. We took his word and climbed this last stretch, which was probably about a kilometer or less, determinedly. When we finally scrambled to the top, huffing and puffing, the sight almost took our breath away completely! we had the place practically to ourselves so we explored the place leisurely. On the way to the fort, we noticed a couple of under-construction sites, where the ground had been leveled with 4 pillars around it. The elderly Himachali man had mentioned that HP Tourism was in the process of building guest cottages on the meadow to provide overnight accommodation. At first, the thought of constructing anything at all over such a lovely piece of land appalled me. However, when we saw these under-construction sites and started to imagine what it would be like to stay there and wake up to a spectacular view, I had a change of heart ! Raghupur fort is said to have been built by the rulers of Mandi as a safe getaway during times of invasion. The fort today, unfortunately, lies completely in ruins with a couple of new mud huts and a temple within its crumbling walls. We walked through them, stepping over rocks and rubble until we got to the farthest end, where we sat for a few minutes enjoying the breeze and fantastic views. What a great place for a royal getaway! The walk back to Jalori Pass was easy and we got there in time for a late lunch. 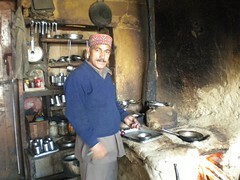 We ate at the same dhaba where we had had breakfast earlier that morning. Funnily, there are at least 5 dhabas in this small 100m stretch and they all offer practically the same menu – chai, Maggi, Kadi Chawal and maybe, omelets; Lord knows how they stay competitive and afloat ! Anyway, after a yummy meal of, yes, Kadi Chawal, a ‘Tourist’-marked jeep pulled up, heading towards Shoja. We hurriedly hopped on, relieved that we didn’t have to wait for the next overcrowded bus to come along. The jeep driver and the passenger sitting next to him were from the nearby village of Khanag (south of Jalori Pass) and turned out to be typical Himachalis: warm and happy to chat. It was a pleasant 5km ride to Shoja. And when we were finally dropped off, the jeep driver refused to accept any payment and sped off ! Today, we decided to walk in the opposite direction from Jalori Pass, towards Saryolsar Lake, which is about 6kms southeast. Like yesterday, we stood outside our hotel hoping for a ride up to the pass. Unfortunately, there was no such luck today and we ended up having to board an over-crowded HRTC bus. It had come along after nearly an hour’s wait so we couldn’t let it pass. Madhu was literally hanging out the door with just a foot in the bus, when it took off! But he managed to somehow squeeze himself in over luggage and men sitting atop the luggage in the aisle. We had a tough time keeping ourselves standing upright what with the bus lurching over every pothole and curve in the road. After 30 excruciating moments, it dropped us off at the Pass; we were already exhausted and there was a 12km round trek ahead of us ! and homes precariously built under the cavities oflarge boulders. And when we got to the lake, we were pleasantly surprised to see a modestly-sized mass of water, set picturesquely with small hillocks surrounding it. It was fenced with by a pink, crisscrossed wooden fence, around which ran a paved pathway for about 3/4th of the perimeter. We first paid a visit to the tiny temple, entry inside which is allowed with the head covered. We paid our respects and then walked along a dirt path that would a little higher above the lake, along the hillocks. Since the lake is sacred, visitors are not allowed to go near it with their shoes on. To bathe, visitors can draw water from it in a bucket but wash themselves away from it so as not to cause any pollution. I thought these were excellent rules to keep the water clean! 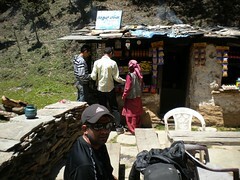 On our way back, we stopped at one of the dhabas for a lunch of Maggi and omelets. It was run by an elderly couple, who let us sit inside their shack, away from the scorching mid-afternoon sun! The little room was barely high enough for Madhu to stand upright in. We sat on low platforms that wrapped around 3 walls of the room and were covered with bedding on the top. It was a cozy and comfortable setting for a meal! The hike back was quite tiring because of the relentless heat. By the time we got back to Jalori Pass, we were glad that we hadn’t attempted doing both Raghupur Fort and the lake on the same day, as planned earlier. We sat outside one of the dhabas waiting for a Shoja-bound bus to come along and then surprisingly, the same jeep that had dropped us off yesterday showed up . We were thrilled when the driver recognized us, waved and asked us to hop on! As the jeep slowly wound its way down the pass we noticed several young (and good-looking, I must admit ) HP policeman walking in the opposite direction towards the Pass. This puzzled us and the driver as well. Further down there were more people on foot trudging up in the terrible heat. One of them informed the driver that about a kilometer further, a bus had broken down in the middle of the road, completely stalling the flow of traffic in either direction. As we drove further along the road, we saw quite a few vehicles stranded and waiting. Our jeep guy pulled up behind them and recommended that we continue on foot as there’s no guarantee when the bus would get fixed or towed. So we did as told, passing the errant bus along the way. Surprising the whole situation of stranded vehicles and people was quite calm and not agitated at all! I can only imagine how chaotic the scene would have been had this happened down in the plains ! Here the Himachali behaved as though it was just life as usual, happy to be sitting around patiently or continuing on foot; quite amazing! It had been a tiring day and the last of our 5-day halt at Shoja. 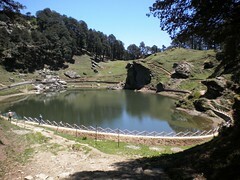 It’s a beautiful place and definitely worth a visit on the way to or from Gushaini/Great Himalayan National Park. From here we were to continue southeast to Kinnaur and beyond. But the weather has continued to be unpredictable in those regions further delaying the opening of mountain passes there. So we have changed our route completely and are now heading in the opposite direction, northwest to the districts of Mandi, Kangra and Chamba. We’ll cover the rest of Kullu and the districts of Kinnaur, Lahaul and Spiti on our way back from Leh! Why is it that we’ve spent nearly 5 weeks in HP and there’s still sooooo much more to explore!? !